Hi! 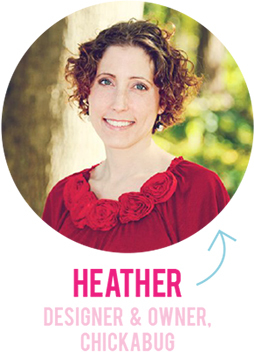 I’m Heather, the gal behind Chickabug – both the shop and the blog. I’m glad you’re here! I founded Chickabug in 2009 and it has since grown into a very busy small business with a staff of 4. This blog is where I share party ideas, DIY projects, free printables, and other fun things that catch my eye. Oh… and pictures of cupcakes. Lots and lots of cupcakes! Please take a look around, be in touch if you need me, and be sure to say hi on Instagram! 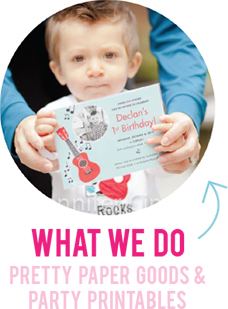 Chickabug, LLC specializes in high-quality paper goods and easy-to-use DIY printables for parties and holidays. When it comes to your special party, we believe it’s the little touches that matter most. And with over 100 party themes to choose from and a wide variety of products within each theme, there’s something here for everyone! Our products are sold in our online shop as well as on Etsy. I designed this blog, and it was coded and implemented by the amazing Otis McCort of Example 7.